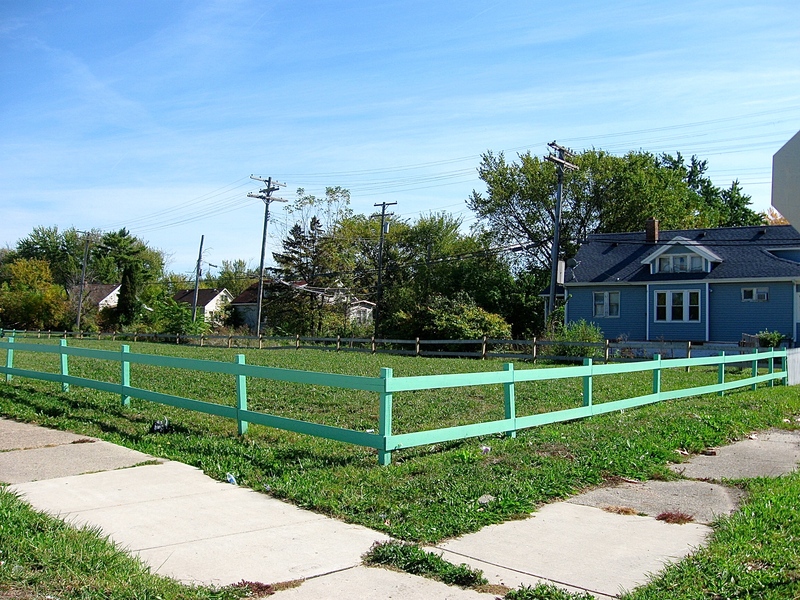 On a recent bicycle ride I stumbled upon a little fenced-off lot on Detroit’s far east side. At first I didn’t pay much attention to it. It was a relatively small lot with a basic two railing fence that lined the property on all four sides. The fence was painted green. Within the fenced lot were small, green plants that looked to be nothing more than short stemmed weeds. But, as I soon discovered while peddling alongside of it, there was more to this fenced in lot than what I realized. 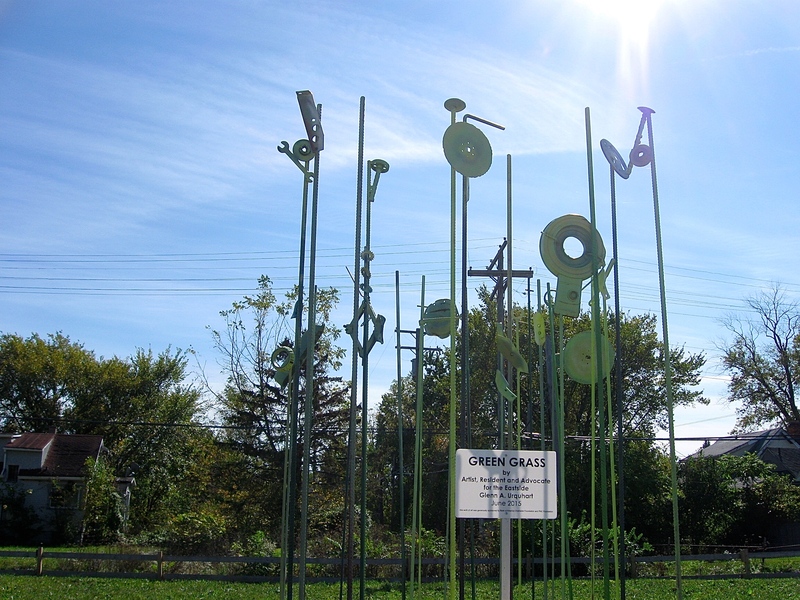 There were a series of tall metal rods with various auto parts mounted on the top of them, creating an interesting sculpture of tall grass stems with the parts representing seeds or flowers. The metal rods and parts were painted green, basically matching the fence and green plants growing in the lot. The sculpture pieces were placed close together and had a unique wind chime sound as a gentle breeze blew them into each other. 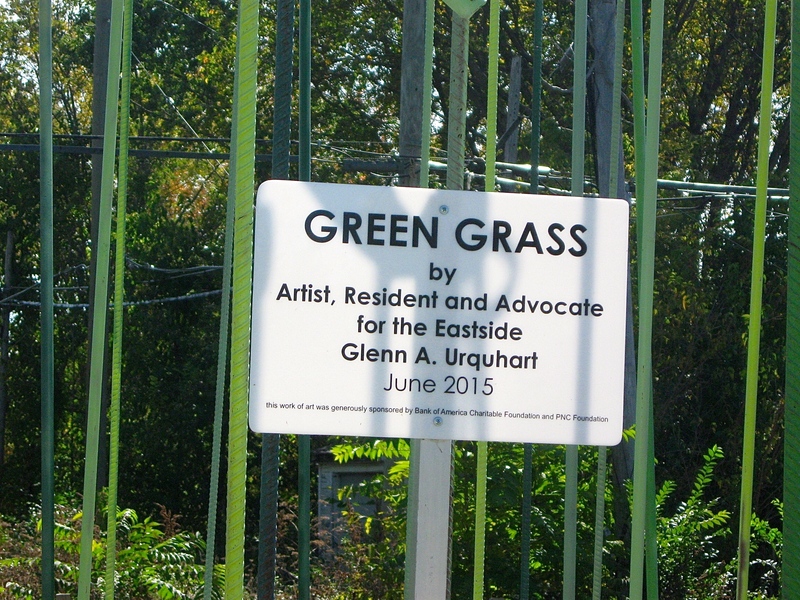 In front of the installation was a sign that read “Green Grass by artist, resident and advocate for the eastside Glenn A. Urquhart”. Upon a closer look at the site, I saw another sign that identified the grass within the fenced lot. To my surprise the little plants were more than weeds. According to the site sign, they are called pennycress. I understand the annual plant is being grown for its seeds that are being developed as a biodiesel. This little lot and the plants that are planted there are a small step toward biofuels that can have a huge impact on future generations. In addition to the Green Grass sculpture and the pennycress plants, there’s a nice little landscaped garden in a small section along the street. It incorporates a rock garden and a separate small plant garden that was full of plants when I was there. I don’t know anything more about this lot or who is responsible for it, but it’s a positive, yet small step in a large puzzle of urban renewal in Detroit. Kudos to those responsible for pulling this all together. Interesting! Perhaps someone will look into this and give it a try in Detroit. Hi, Charlie, permit me to fill in some more details of your “find”! You were biking along a stretch of Mack Avenue, east of Conner which is intended for a full Green Thoroughfare installation. The “Mack Avenue Green T” is sponsored by LAND, Inc., (Land Assembly for Neighborhood Development – LAND, Inc.on Facebook) with funding so far by a variety of sources, i.e., Erb Foundation, Bank of America and DTE Foundation. 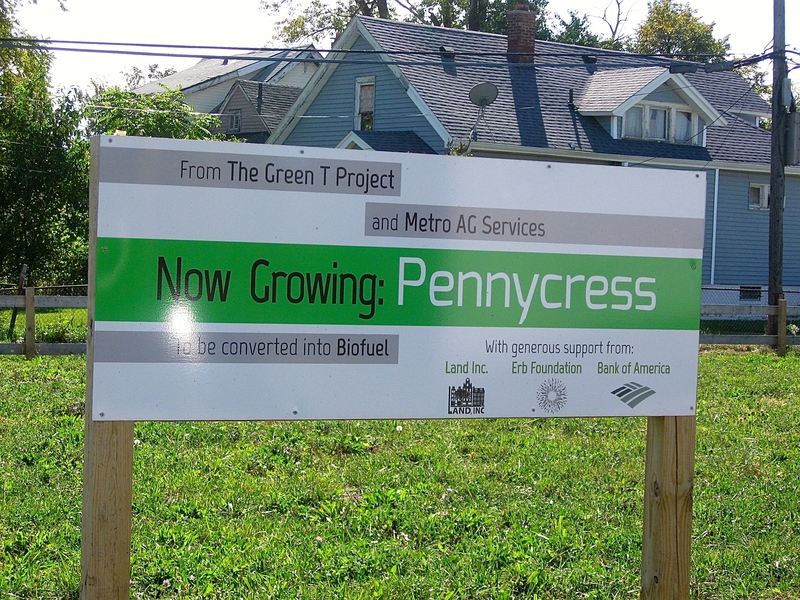 The first tentative steps in the project are the penny cress crop you saw (which is actually the second crop planted – the first was harvested in 2014 and yielded a significant amount of biodiesel fuel stock for such a small patch of ground) as well as the public art. 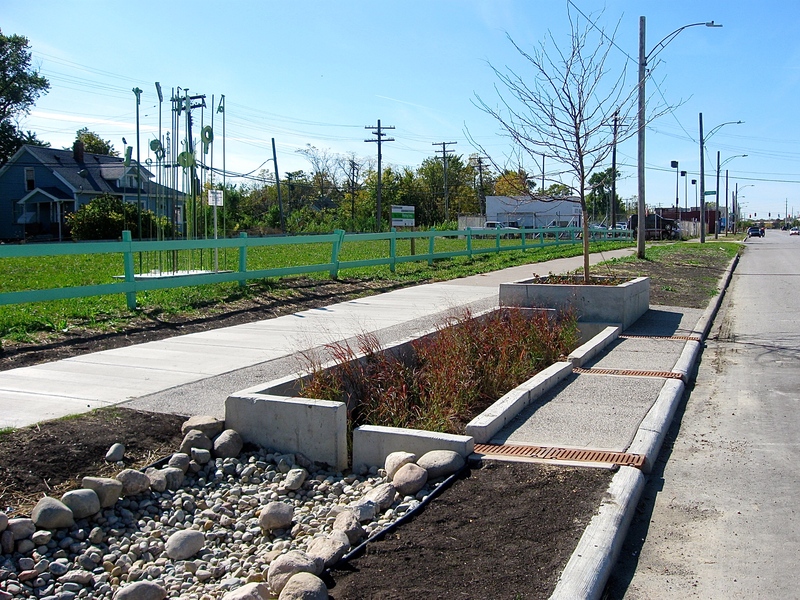 The “landscaped garden” is actually a working bioswale which draws storm water off the roadway and rather than running into the public sewer, the water flows through the plants in the bioswale and gets filtered, and then soaks into the ground through a perforated storage tank buried under the plants. There’s an access pipe through which excess water can be drawn out of the pipe to water the pennycress or any other plantings near by. This bioswale as well as the pennycress and the artwork are all demonstrations of what could be. You are correct that we are working on a puzzle of vacant land, neighborhoods needing improvement, and infrastructure that needs to be brought into the twenty first century. Steps like these can change a city! Thanks so much for this information. It’s quite interesting and puts the whole project in perspective. Like you say, steps like this can change the city. I appreciate the comments and thank you for checking out my blog.